The work of Kochakian and Murlin s provides the basis for the use of anabolic steroids. The pharmacological properties of these steroids has proved of clinical value in the treatment of conditions where protein synthesis and reduced nitrogen loss is desired. Their use has been extended by "power event" athletes who have attempted to develop increased muscular contractile force. The use of anabolic steroids for this purpose is reported to be wide spread. Johnson and O'Shea 4 found that strength, body weight, oxygen uptake and blood nitrogen retention were significantly increased when healthy subjects were administered an anabolic steroid. Fowler 3 reported no effects of steroids on strength. Casner, Early and Carlson Z reported iio significant strength increase due to steroid treatment. Aricl' found psychological enhancement of human performance by administration of placebos as anabolic steroids. Six male varsity athletes were used. All six volunteers had experienced two years of weight training, five days a week. For a period of four months prior to the beginning of the test procedures all the subjects lifted for five days and were tested on the seventh day in the bench, military and seated presses and a squat. A standard warm up procedure was performed and each test was a maximal lift. The experiment was conducted during a subsequent eight week period. On the second, third, and fourth weeks of the study all the subjects were given placebo pills daily and informed they contained 10 mg. of 17betahydroxy-17alfa-methyl-androsta-1,4dicne-3 -one, an oral anabolic steroid. From the fourth to the eighth week a double blind technique was used. Three of the subjects received 10 mg. of the oral anabolic steroid (17beta-hydroxy-17alfa-methyl-androsta-1,4diene-3-one) and the remaining three subjects continued to receive the placebo. The oral anaoblic steroid and the placebo were assigned to the subjects by code, by the University Health Service and the investigator was not informed which subject received the steroid until after the eight weeks testing period. 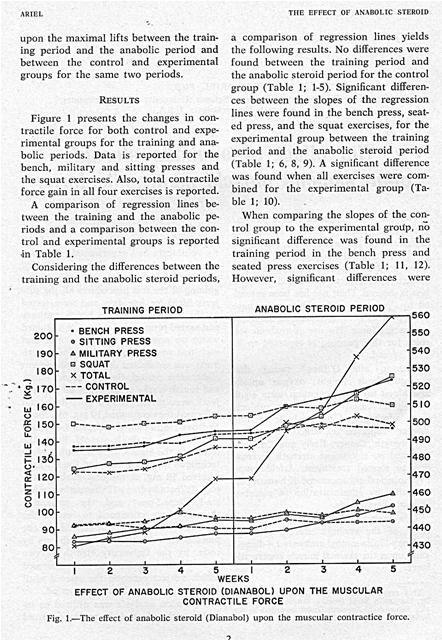 A comparison of regression lines between the training and the anabolic periods and a comparison between the control and experimental groups is reported -in Table 1. .F-ratio significant at the .05 level of confidence. Reg. Coef. = Regression coefficients; TP = Training period; AP = Anabolic steroid period; C = Control group; E = Experimental Group. found in the same exercises during the anaboliciperiod (Table 1; 16, 17). 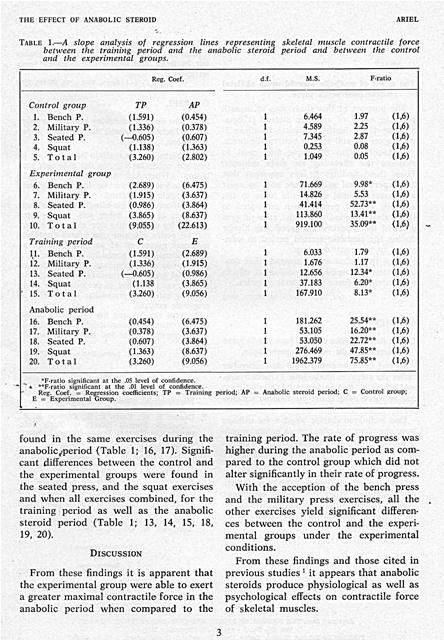 Significant differences between the control and the experimental groups were found in the seated press, and the squat exercises and when all exercises combined, for the training period as well as the anabolic steroid period (Table 1; 13, 14, 15, 18, 19, 20). From these findings and those cited in previous studies' it appears that anabolic steroids produce physiological as well as psychological effects on contractile force of skeletal muscles. The purpose of this study was to investigate the effect of anabolic steroid (17betahydroxy-17al fa-methyl-androsta- l,4-diene-3one) upon skeletal muscle contractile force. Une technique double blind a ete utilisee pour examiner son effet sur six sujets masculins. On a trouve que le groupe experimental etait capable d'exercer une force contractile maximale.plus grande dans la periode sous faction du steroide anabolique par rapport a la periode d'cntrainement. Le taux de progres du groupe experimental etait egalement plus eleve pendant la periode sous 1'action du steroide anabolique par rapport au groupe temoin. I1 apparait de la que les stcroides anaboliques produisent des effets physiologiques sur la force contractile des muscles squelettiques. El efecto de los esteroides anab6licos sobre la fuerza contractil del musculo esqueIetico. El objeto de este trabajo ha sido el de investigar sobre los efectos del esteroide anabdlico (17bcta-hidroxi-17alfa-metil-androsta1,4-diene-3-one) sobre la fuerza contractil del musculo esqueletico. Una tecnica "double blind" se emple6 para examinar el efecto sobre scis sujetos varones. Se ha encontrado que cl grupo experimental podia efectuar una fuerza contractil maximal mayor en el periodo bajo la acci6n de esteroide anab6lico en relacion al periodo de entrenamiento. 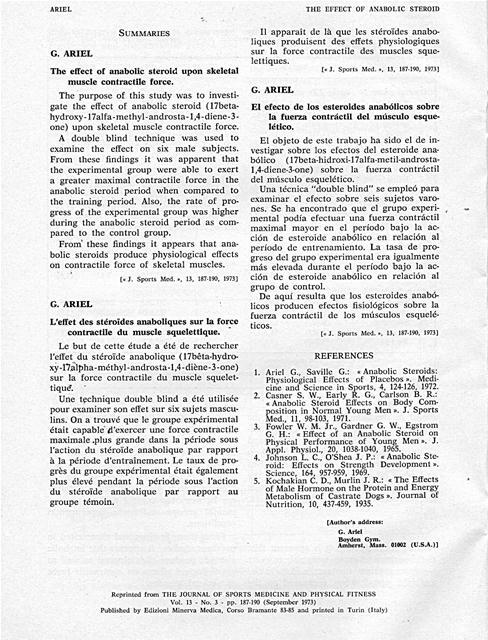 La tasa de progreso del grupo experimental era igualmente mas elevada durante el periodo bajo la acci6n do esteroide anab6lico en relacion al grupo de control. De aqui resulta que los esteroides anab6licos producen efectos fisiol6gicos sobre la fuerza contractil de los m6sculos esqueleticos. 1. Ariel G., Saville G.: -Anabolic Steroids: Physiological Effects of Placebos a. 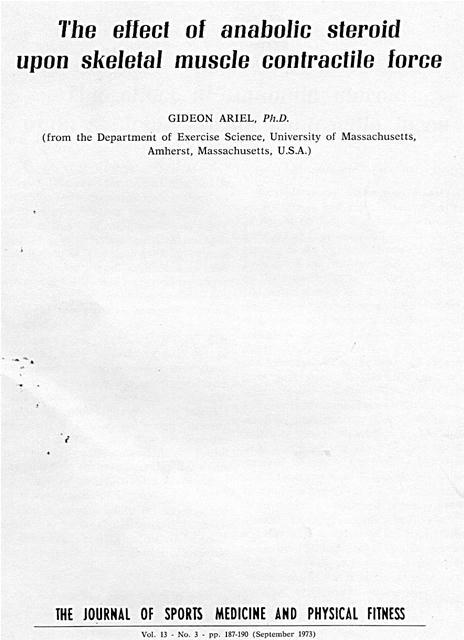 Medicine and Science in Sports, 4, 124-126, 1972. 2. Casner S. W., Early R. G., Carlson B. R.: '. Anabolic Steroid Effects on Body Composition in Normal Young Men a. J. Sports Med., 11, 98-103, 1971. 3. Fowler W. M. Jr., Gardner G. W., Egstrom G. H.: a Effect of an Anabolic Steroid on Physical Performance of Young Men-. J. Appl. Physiol., 20, 1038-1040, 1965. 4. 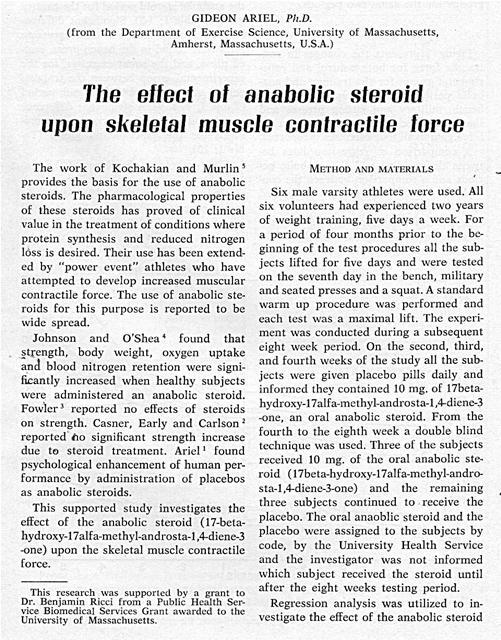 Johnson L. C., O'Shea J. P.: K Anabolic Steroid: Effects on Strength Development n. Science, 164, 957-959, 1969. 5. Kochakian C. D., Murlin J. R.: ï¿½ The Effects of Male Hormone on the Protein and Energy Metabolism of Castrate Dogs a. Journal of Nutrition, 10, 437-459, 1935. Generated on 4/25/2019 8:41:43 PM (PST) ADI/HQ/GBA/2019/ARIELCLOUD/v3.0.2018.0126.